In 2014, Clara, a single mother of 3 daughters, was living in an unsafe and unstable environment. With no family close by, Clara struggled to pay rent and provide for children on a single income. 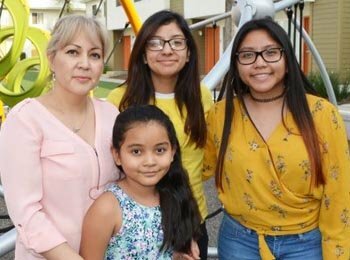 She longed for a home where she and her daughters could feel safe, but the apartments she found in Azusa either weren’t safe or out of her limited budget. When they moved into CHW Azusa, Clara finally had the safety her family needed with rent she could afford. The gated community offered Clara and her family both security and peace of mind. Her apartment was beautiful and spacious, so her daughters had room to live, play, and grow together in their new home. The stability she found in her CHW apartment allowed Clara to better provide for her family. But, she had no idea that CHW Azusa offered CHW’s award winning programs for free to all residents. Once Clara and her daughters got involved at the CHW Community Center, everything changed. With the encouragement of CHW Azusa’s Community Building Coordinator Josh, Clara’s daughters came to the Community Center for CHW programs. They started making friends, gaining confidence, and most importantly, feeling like they belonged in their new community. In the Study Stars afterschool program, 8 year old Bella discovered a love of reading with access to volunteer tutors and leading edge e-learning software. Clara’s 17 year old daughter Angie and niece Marisol are actively involved with CHW’s Achiever high school leadership program. Angie, Marisol and Clara’s 20 year old daughter Stephanie are on the path to careers in medicine and business. And, they aren’t the only ones with a brighter future. With support from CHW’s Community Center and her neighbors, Clara emerged as a leader in her community and in her city. As a CHW resident, Clara could attend the Community Leadership Institute, which inspired her to use her voice and become a leader. Clara works with Azusa’s Grassroots ESL Initiative to teach ESL classes to CHW residents at the Community Center. She attended NeighborWorks’ prestigious Community Leadership Institute where she connected with other resident leaders in affordable apartment communities nationwide and learned valuable leadership and community organizing skills. She is currently leading efforts to plan a community-wide talent show at CHW Azusa to strengthen community ties between her neighbors and their families. Inspired by her fellow residents and her daughters, Clara aspires to go back to school for a career in the medical field.